Water Wellbeing Ltd has two operational trading companies. Edgar’s Water and Wellbeing People. Edgar’s Water supplies water coolers, bottled drinking water and fresh fruit deliveries throughout the UK to any organisations that needs to hydrate their workforce. They operate over six sites and are distributing throughout the UK via 100 fleet vehicles. The original bottling company was established in 1977 and has expanded rapidly over recent years. Wellbeing People provides health and wellbeing engagement to empower individuals, at work or in the community in order to help improve their general health and wellbeing by making positive lifestyle changes. 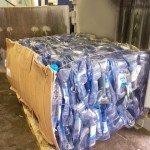 Water Wellbeing uses primarily 19 litre polycarbonate bottles which are filled with pure English drinking water and supplied to 20,000 water coolers at customer sites throughout the UK. The bottles are re-usable so are returned to the plant for inspection and processing, however, a percentage of these fail the inspection and are segregated for recycling. Historically these bottles have been collected via flatbed hauliers which is costly, they take up a lot of storage space and is not good for the environment. 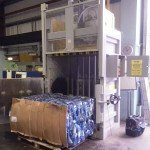 Investing in a KK 500 mill-size baler has allowed the company to remove scrap bottles from the system immediately, saves storage space, reduces haulier visits and has the benefit of a cash revenue from a plastic recycling company. It is estimated the payback on the investment will be two years. The main advantage is ongoing cost saving on transport and premium warehouse storage space, however, it is a huge benefit to be completely recycling of all plastic bottles.